UPDATE – Jan. 13, 2017 – It seems as if the team of Pebble developers and technical people that Fit-Bit hired through their acquisition of Pebble are quite positive regarding the future of the existing Pebble platform for at least the next year and possibly beyond. Rumors abound as to whether a future Fit-Bit hardware product will incorporate everyone’s favorite Pebble Watch features and functions, but it’s my opinion that they wouldn’t have spent the effort and money (rumored to be about $40 million) and hired a bunch of Pebble People if they were just going to let it die. Not much has been updated regarding warranty service or technical support, but there are some aggressive prices on left-over Pebbles on Amazon, so the real die-hards can just buy a relatively inexpensive replacement if their Pebble fails. I any event, it’s no longer the doom and gloom that was first reported and that I detailed in the original posting. Stay tuned! UPDATE – Dec. 16, 2016 – Last night around 3 am my Pebble watch woke me with a series of vibrate alerts because it was undergoing an update to V 4.3, and this morning the Android App also updated to Version 4.3.0-1355-904fed2. In light of the first announcement that all support operations would cease, this seems to be a small ray of hope in an otherwise dark tunnel. Perhaps it was due to the relatively passionate feedback that Fit-Bit received on their user support community blog from discouraged Pebble owners. I understand that acquisitions of this type can be complex and inordinately detailed regarding exactly what the new owners can claim rights to and what they can’t touch. Apparently, actual watch hardware is / was off limits to Fit-Bit as part of this deal. They acquired some of the Pebble brain trust and the intellectual property and the rights to all of the software and development shell. For sure, the “blame” for this debacle rests squarely on Pebble’s shoulders, with Fit-Bit seemingly playing “white knight” so that the whole Pebble community wasn’t just sucked into a black hole when Pebble’s former owners decided to fold. They likely had to make a quick and expensive business decision to move in when Pebble vacated their responsibilities to their loyal users, and hold together as much of the old company as they could. Now, it seems as if they are just trying to sort through and figure out what to do with the abandoned storage locker they just bought. For those of you who can’t figure out what this post is about or didn’t hear, Pebble, a wildly successful Kickstarter campaign that generated tens of millions of dollars, and delivered millions of pretty darn good smartwatches to a giant and loyal user base, called it quits yesterday, December 7th. I have had three of them and I wear one daily. Well, I spent some time this morning researching the Pebble debacle, and it is as bad or worse than you (we) feared. Basically, everyone who owns, has ordered, or ever wanted to order a Pebble watch is screwed. They collected around $12.3 MILLION in their latest Kickstarter campaign, and at least for some (or much) of that time knew that they would not be able to continue operations into the future. The left-over bones of this well gnawed turkey were purchased by Fit-Bit. They claim that they will do the honorable thing as far as eventually refunding money to those who paid for and didn’t (and won’t) receive a product, but announced that, as of yesterday, anyone who has a Pebble watch will no longer see updates, technical support or warranty service, should they require it. So, Pebble functionality will likely degrade rapidly as updates are made to the Android operating system that potentially conflict with Pebble software. 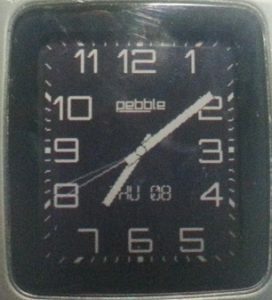 One pundit went so far as to suggest that if Android released an update tomorrow that renders Pebble watches useless, millions of dedicated owners would, in effect, be wearing nothing more than a very expensive digital watch. Some suspect, though, that the watch itself actually doesn’t really know what time it is, and that the time display is dependent on communication with the attached phone, at least as far as maintaining accuracy. Therefore, if the phone no longer updates the display, they (we) will own a very expensive digital watch that doesn’t even tell time as well as a $2 Wal-Mart kiddie watch, but with no way to “set” it. So, it appears that, yet again, we have come to another technological dead-end. Some of these, like floppy disk storage and music CD’s, faded slowly but are dead none-the-less, despite at least some desire from a portion of the user community that they survive. Pebble, on the other hand, with a huge and fiercely loyal user base, just shot itself in the head and lays, lifeless, on the floor. All that remains is tasking someone to wipe up the blood. Apparently, that job goes to Fit-Bit, who, as they have been up to now, a direct competitor, may just let the blood dry up, and walk away. Only time will tell (pun intended) if they will integrate some or all of Pebble’s functionality into one of their future products. In any case, you (we) will have to buy some new Fit-Bit model to get that functionality if we want it back. My bitterness at being orphaned so suddenly makes me think I will just go back to wearing my trusty old stainless-steel Rolex clone. At least it tells time. I wonder how much of that $12 Million went towards buying Champagne and White Castle sliders for the after party. « Security Online – Yes, YOU!